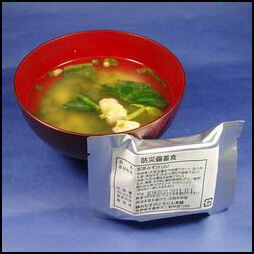 Miso soup from a package Kaiseki is a style of cooking that has been around for centuries. A typical kaiseki lunches consists of delicious and beautifully arranged food’such as clear broth appetizer, boiled or broiled fish and vegetables, fried, steamed, heated or vinegared foods, soup, rice, pickled vegetables, and fruit’served on small dishes. A typical Buddhist vegetarian meal includes things like persimmons seasoned with a tofu dressing vinegar-soaked vegetable wrapped in yuzu, and citrus. Japanese curry is one of the most popular dishes in Japan. It is slightly sweet and thick and less spicy than Indian curry and less milk than Malaysian curry. There are even restaurants in Singapore that specialize in it. Curry was introduced to Japan in the 19th century and became popular in the 1950s when instant Curry mixes, cubes and bricks became fixtures of supermarket shelves. It is usually served with rice and made with beef or chicken. Potato, carrot and onion are common ingredients. There are stories that curry was introduced to Japan in 1853 century by Indian chefs on Matthew Perry’s black ships, and popularized when it was consumed by the Japanese army in the Meiji period (1868-1912) to make rice more tasty. A lot of Japanese like to have rice and miso soup at every meal every day. When they travel abroad they often bring their own rice and miso soup packets with them from home. Many Japanese foods owe their taste to a bacteria---Aspergillus Oryzae--- used in making soy sauce, sake, miso and other foods. katsudon Typical Japanese dishes sukiyaki (thin sliced beef, tofu and vermicelli prepared in a special iron pan on the table and dipped in a small bowl of raw-beaten egg), shabu-shabu (thinly slice beef cooked with vegetables in a special broth and served with sauce mixed with vinegar or sesame), yakiniku (sliced beef or pork you barbecue yourself at your table) and okonomiyaki (meat-and-vegetable pancake, with generally with cabbage and shrimp, octopus, pork, or noodles, eaten with a brown sauce and mayonnaise). Tempura is seafood, vegetables or meat coated with a light batter made from egg and wheat flour, deep fried in vegetable oil, and served with soy sauce with grated radish and ginger. Tendon is a casual, inexpensive and filling version of tempura in which batter-fried fish and vegetables are served as a topping for rice. Among some other Japanese dishes that are worth trying are kushiage (deep fried chicken, pork and vegetables skewered with a bamboo stick), yakitori (which means skewered chicken, but also constitutes skewered pork, beef and vegetables dipped in a sweet soy-sauce-based barbecue sauce), tonkatsu (a deep-fried, bread-crumb-covered pork cutlet served with cabbage and a special brown sauce), and unagi (delicious delicately-flavored barbecued eel cooked on a charcoal fire and repeatedly dipped a special sticky, sweet barbecue sauce made with soy sauce and sake). Her recipe for enough omuraisu (Rice omelet) to serves four uses the following ingredients: A) ½ onion; B) 3 bell peppers; C) 8 mushrooms; D) 300-gram chicken fillet; E) 4 strips bacon; F) 1-1/2 teaspoon salt; G) Pinch of pepper; H) 1 tablespoon vegetable oil; I) 4 bowls (600 grams each) cooked rice; I) 5 tablespoons ketchup; K) 8 eggs; L) Pinch of salt; M) 4 teaspoons vegetable oil. Sukiyaki ingredients for six people: 1) Warishita (sauce); 2) 300 ml sake; 3) 100 ml soy sauce; 4) 2 tablespoons sugar; 5) 2 packs of yakidofu (grilled tofu); 6) Variety of mushrooms such as shiitake, shimeji, enoki; 7) 300 grams (1 large pack) shirataki noodles; 8) 2 naganegi leeks; 9) 1/4 head hakusai (Chinese cabbage); 10) 1 bunch shungiku; 11) 1.2 kg sukiyaki beef; 12) Beef suet or 1 teaspoon vegetable oil 13) 6 eggs. oden In the spring Japanese eat dishes such as takenoko-gohan (tangy sprouts of bamboo shoot), red snapper and giant clams. Popular summer foods includes hiyamugi (chilled noodle dishes), hiya-yakko (a tofu concoction), bonito (a fish with red fatty meat), and eel broiled in a tasty barbecue sauce. In autumn people enjoy giant expensive matstake mushrooms, grilled sanma (succulent fish, saury pike, with few bones), and saba (mackerel). Popular winter dishes include oysters, sukiyaki, and konnyal cooked in soy sauce broth and eaten with mustard). Fugu is the blowfish with its poisonous liver removed. A fixture of Japanese wintertime dinner is nabe, a sort of stew made with chicken, pork, seaweed, dried fish, seafood and/or vegetables boiled at the table in special earthenware pots on a cooker on the dinner table. and eaten with a sauce made from vinegar, horseradish, green onion and soy sauce. Chanko-nabe is a high-calorie nabe consumed by sumo wrestlers. Another winter time favorite is oden, slow-simmering soup with a strong, distinctive smell often sold at convenience stores. Made with a beef broth, it contains hard boiled eggs, slices of daikon, fish balls, root and sea vegetables, fish sausages, daikon and large pieces of tofu. Those who buy at convenience stores tell the cashier which items they want. There are hundreds of others dishes and different regions often have their own specialties. Kyoto is known for its delicate seasoning, Tokyo for its robust cooking. Osaka is the one place that is especially famous for food. One popular Japanese food that Westerners generally don't like is natto, fermented soybean paste. wasabi A variety of foods in Japan are marinated in various combinations of vinegar, soy sauce, sugar and sake. Ginger is commonly pickled or grated and then squeezed to extract the juice which is used to flavor meat and salads. 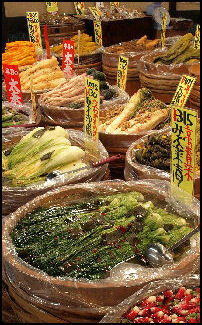 Most spices used in Japanese cooking were introduced from China and Korea. Wasabi is a spice unique to Japan. Sometimes called Japanese horseradish or green mustard, it is a spicy hot, pungent paste that comes from the trunk-like upper root of the wasabi plant and is often what gives some zing to sashimi, sushi, soba noodles and other foods. It can also be used as a disinfectant, preservative and antipoison and can be used to sterilize raw fish and get ride of fish odors in the air. 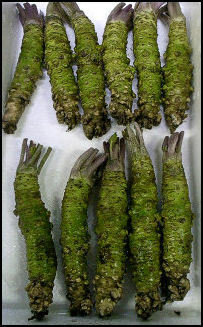 Wasabi is grated and often served with sushi or sashimi. A member of the mustard family like horseradish, it is grown in paddies in which was the water is moving and is between 10 and 15 degrees C. Because of these requirements, wasabi is best grown in areas with cold mountain streams. These days Japanese wasabi producers are suffering as result of cheap imports from China and Taiwan. Wasabi is hard to grow commercially. It takes about 18 months to mature and is produced mostly in Shizuoka Prefecture. It comes from a wild plant that is found along clear mountain streams on all four of Japan's major islands. Historical documents from the 10th century list wasabi as a gift given to the Emperor. Americans became suspicions about MSG after a Chinese-American physician wrote what he meant to be a lighthearted letter to the New England Journal of Medicine, saying he experienced numbness, palpations and weakness after eating in Chinese restaurants and wondered if MSG was the cause. After that MSG was labeled as a toxin and removed from a long list of foods, including baby food, and made a lot of Americans wary and suspicious every time they entered a Chinese restaurant. A number of studied have debunked the “Chinese restaurant syndrome,” showing that consuming MSG in normal amounts has no effect on the vast majority of people. Still suspicions about the flavor enhancer remain and but generally it is only unhealthy---but also doesn’t taste very good---if it is consumed in large amounts. In 1995, the FDA cleared glutamate of all serious charges leveled against it. A review of research by the World Health Organization and Food and Agriculture Organization of the United States came to the same conclusion. Even so some food experts assert that MSG is harmful to one’s health, blaming it for a range of serious neurological and physiological aliments, and insisting it has no effect on the flavor of food. Some studies have identified MSG as a possible ecitotoxin which overstimulates neurotransmitters to the point of cell damage. Kyoto-style pickles Umami is a “fifth taste” recognized in Japan but doesn’t have a direct English translation. It has unofficially been recognized for centuries but wasn’t officially identified as a unique taste until it was recognized as such by the Japanese scientist Kikunae Ikeda of Tokyo Imperial University in 1908. In 1985 the term became officially internationality recognized at a taste common to tomatoes, cheese and pork that does not fit into the well-known categories of foods: sweet, sour, bitter and salty. Imparted by glumate and robonucleotides, unami is a subtle, savory taste that occurs naturally in many common foods used widely around the world including fish, vegetables and dairy products. But often it is most detectable in ingredients used specifically in Japanese cooking. Cooks in Britain that create the umami taste experience do so with typical Japanese ingredients like kombu (kelp), katsuobushi (dried bonito flakes), niboshi (small dried sardines), soy sauce and shiitake mushrooms. Umami finds it ways into bags of Japanese potato chips as “kombu essence.” It has been identified in Western foods such tomatoes, meat stocks and cheese. takoyaki restaurant Outdoor and indoor yakitori bars serve grilled chicken, beef and vegetables served on a stick and other hot, snack foods. Takoyaki (gooey dumplings made with octopus legs is a snack associated with the Osaka area. The golf-ball-sized, gooey, balls are made on special pitted grittles in stands along the sidewalks. They are extremely hot with fish flakes and a sweet brown sauce. The octopus is chewy, the outside is soft and the inside is gooey. Autumn treat include a variety of pastries made of chestnuts and sweet potatoes. Common snacks found on the streets and in convenience stores include various rice balls, cheap bento boxes, snacks, sweets, sandwiches, shrimp-flavored chips, sweet potato balls, fried lotus root stuffed with hot mustard, pea-flavored puffs, shredded dried squid. In Japan you can get seafood snacks that have a picture of an octopus with a blue banana. Fritolay products feature Chester Cheetah instead of the Frito Bandito. Adzuki bean paste in a component of many Japanese deserts, sweets and sweet snacks, Bean-paste-filled buns known as anpan are found in almost every bakery in Japan. Bean paste often fills pastries rather than creams and chocolate. 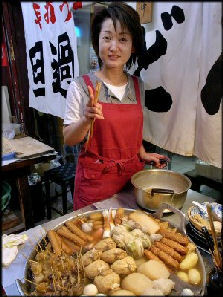 Many foreigners are not so fond of it and are surprised when they bite into a roll and fine bean paste inside. Japanese eat chrysanthemums and deep-fried maple leaves. In, Shizuoka Prefecture cherry leaves are pickled and used to rap sweets like rice cakes with bean inside. The pickled leaves are valued for their sweet smell. The town of Matzuzakischo produces 2 million leaves a year, 70 percent of Japan’s total. sweet breast pudding Japanese sweets and deserts tend to be less sweet than their Western counterparts. Many Japanese don't like overly sweet stuff and worried that eating to much sugar will give them diabetes or cause other health problems. Moreover, Japanese tend to eat sweets between meals with tea and not necessarily as a dessert. Desert is often fruit. Japanese-style restaurants generally don’t offer desserts, although Western-style restaurants do. Most Japanese buy goodies at plentiful bakeries or sweet shops and take them home. The deserts sold at bakeries are good but sometimes expensive. Common desserts sold ta bakeries include cream puffs ( su cream), cheesecake (similar to sponge cake), chocolate pastries, strawberry cakes and a variety of cakes and pastries. Japanese sweet shops sell a variety of concoctions that Westerners are unfamiliar with. Desserts served at coffee shops include things like shaved ice with apricot sauce or shaved ice with green and sweet red been topping. A lot of deserts are made with sweet bean paste, jello-like jellies and agar (seaweed-based gelatin that has a slightly fishy taste). Sweet bean paste is served as toping on ice cream and found in side a wide variety of sweet buns and popsicles. Sweet potatoes are regarded as a sweet. They are roasted in large ovens on the back of trucks that roam neighborhoods and produce an whining, droning noise. Kid are fond of eating frozen fruit jellies. Kamaboke is a traditional sweet that has been around for almost 1,000 years. Described in an ancient document as being in a court meal served in 1115, it is made with steamed white fish mashed into a paste, seasoned and colored. In the Tokyo area traditionally blue fish has been used. In the Osaka-Kyoto area lizardfish is favored. These days kamaboke is usually made of frozen fish imported from abroad. 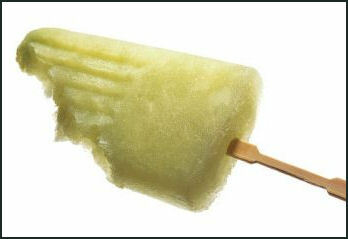 wasabi popsicle During the summer, Japanese enjoy green-tea flavored ice cream, and shaved ice flavored with sweet fruit syrups and sweet adzuki beans. Shaved ice desserts have a long history in Japan. Lady Sei Shonagaon listed it as one fo her “Elegant Things” in the 10th century Pillow Book. 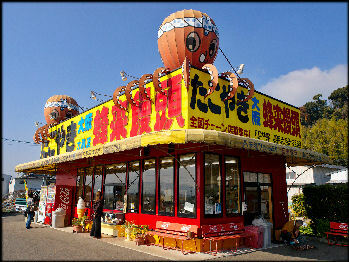 A confectionary shop in Ishinomaki does a good business selling ice creams made from saury (a slender beak-nosed fish), sea slugs, whale meat, soft-shelled turtles and cedar chips. Other exotic ice creams include pickled orchid ice cream from Toyama, chicken wing and shrimp ice creams from Nagoya, and eel-flavored and clam-flavored ice cream from Shizuoka prefecture. Funagata, a small town in northern Japan, is experimenting with making ice cream from poisonous pit vipers and fireflies. A pork restaurant in Kyoto makes ice cream local chili peppers, soybeans and buckwheat cookies. An aquarium in Yamagata Prefecture sells ice cream containing diced jellyfish. Products made with beer-flavored ice cream have been released in a number of places. One concoction uses mild Gyoza Roman beer and is 15 percent beer and 1 percent alcohol. 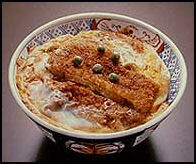 A specialty of Hokkaido is sea urchin ice cream. Other ice creams be been made with garlic and bits of beef tongue. 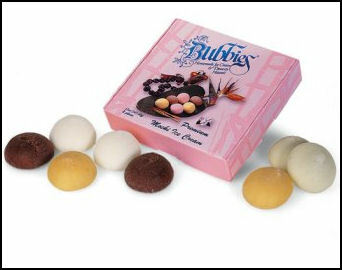 Valentine Day chocolate The Japanese are the world's second largest consumers of chewing gum behind Americans. In Japan, you can buy caffeine-enriched, coffee-flavored gum that promises to wake you up. 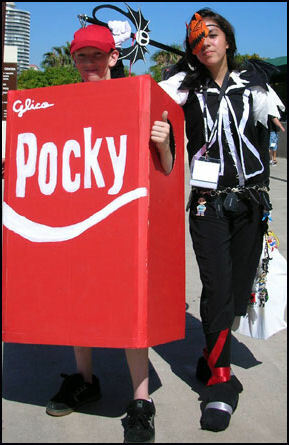 On average, Japanese eat 1.88 kilograms of chocolate per person. In contract Germans eat about 3.5 kilos; Britons, 3.2 kilos; the French 3 kilos; and Americans, 2.5 kilos. Studies have shown that up to 90 percent of chocolate purchases made at convenience stores are made by women. 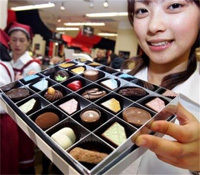 To get more salarymen to buy more chocolate, “refreshment boxes” filled with chocolate have been put in offices. Buyers pay using the honor system. The Japanese are as innovative and quality conscious when it comes to chocolate as they are with everything else. It possible to buy chocolate eggs with realistic-looking bull terriers and ayu fish inside. Konnyaku was consumed in Heian period (794-1192) and described in poetry by the great Japanese poet Basho. It contains large amount of ceramide, which can retain and block moisture. This quality makes it an attractive additive for food and cosmetics. In the West ceramide was extracted from cattle brains until the outbreaks of mad cow disease brought an end to the practice. Konnyaku roots used in foods is cut into thin slices and carried on a conveyor belt and air-treated in 140 degrees C for temperatures about two hours a computer-controlled drier three times as a tall as an adult. The slices are then smashed and purified to produce powder, which is the kneaded with water and boiled with an alkaline solution . Most konnyaku is produced in Gunma Prefecture. 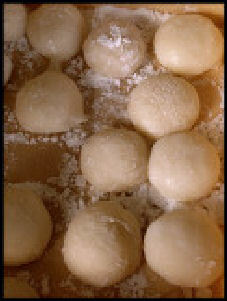 mochi Mochi is a soft, chewy blob-shaped rice cake which can be eaten raw, boiled, toasted or grilled or placed in a soup. Along with sake, it is one of the most popular offerings to the Gods. It also a popular New Year food. Mochi has been around for at least 1000 years. In the old days, the rice for mochi was pounded by men using sledgehammer-size wooden mallets and the pounded rice was steamed for 40 minutes into a smooth paste and then shaped by women into mochi. Today, mochi is made primarily made at rice stores and confectionery shops or in big factories with special rice-kneading machines. Families sometimes put some mochi on small stool-like alters, which are taken to the local Shinto shrine and placed on shelves with tags that identify the families who offered them. Rice has religious significance in Japan and mochi is considered a symbol of happiness. It is also eaten at festivals, weddings, the building of a new house and other occasions. The New Year's shrine at the entrance to the house usually contains two large circular slabs of mochi that are stacked one on top of the other with an orange, some straw and other decorations on top of that. The Tokyo fire department advises elderly people in particular to cut the mochi into small pieces, "wet the throat, chew it fully and then swallow" and recommend that the mochi be eaten in the presence of others. Using a vacuum cleaner is the best way to get mochi un stuck in someone’s throat. In a famous scene from the Japanese movie Tampopo, an old man choking on mochi is first turned upside down and when that doesn’t a vacuum cleaner nozzle is jammed down his throat and the mochi is sucked out. There were six mochi deaths in the Tokyo during the 2010 New year weekend. Twenty-four people were hospitalized after choking on mochi. The six that died were between 75 and 95. One of them, a 66-year-old woman, died after being given complimentary pieces of mochi at a pachinko parlor.